Funeral services were held Thursday at the Hack Chapel, Beecher, for Mrs. Lillian Wegert of 3145 Belden, Chicago. The Rev. John Wyngarden, pastor of the First Presbyterian Church of Chicago Heights, officiated at the services. 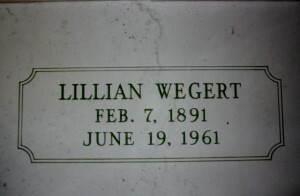 Mrs. Wegert is survived by her husband, Dr. H.H. 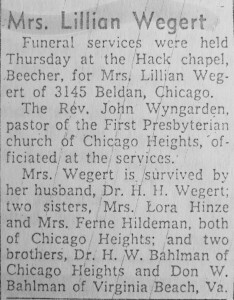 Wegert; two sisters, Mrs. Lora Hinze and Mrs. Ferne Hildeman, both of Chicago Heights; and two brothers, Dr. H.W. 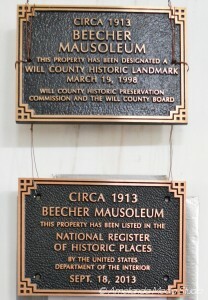 Bahlman of Chicago Heights and Don W. Bahlman of Virginia Beach, VA.
Other, more distant family include: Batterman, Bergmeier, Beseke, Bielfeldt, Bohl, Cloidt, Dunlap, Engleking, Fick, Fiene, Freerking, Frobose, Guritz, Hack, Hager, Haltenhof , Heine, Heldt, Hoffman, Hoppensteadt, Horn, Hunte, Kaczynski, Kappe, Kilborn, Kirchhoff, Klocksieben, Koch, Langreder, Leder, Maass, Matthias, Mc Carty, Meyer, Monk, Niedert, Ohlendorf, Pansa, Peters, Pralle, Riley, Ristenpart, Rohe, Rust, Selk, Struve, Thielman, Vagt, Von Engeln, Wehmhoefer, Wiechen, Westphal, Wilkening. This entry was posted in Automated Burial Listing, Burial Listing, Burial Location, First Presbyterian church - Chic. Hgts, HEADSTONE, Obituary very limited by Sandra. Bookmark the permalink.